In the ever-evolving world of music it seems that new genres are born every day, ranging from the accesible alternative-rock to the hipster’s avant-garde-neoclassical-jazzy-grindcore. 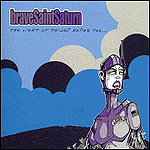 Now, from members of Five Iron Frenzy comes the launch of a new project, Brave Saint Saturn, and with it a whole new genre of music. Welcome to the final frontier: astro-rock! Pushing musical and lyrical boundaries is all in a day’s work for Five Iron Frenzy and Brave Saint Saturn members Reese Roper, Dennis Culp, and Keith Hoerig.